The Mogao Caves, located near Dunhuang in the Gobi Desert in northwest China, comprise nearly 500 Buddhist cave temples dating from the 4th to the 14th century, many decorated with exquisite wall paintings and sculptures. Located strategically along the ancient Silk Road, these caves were visited by millions of travelers, merchants, and Buddhist pilgrims for over a thousand years. 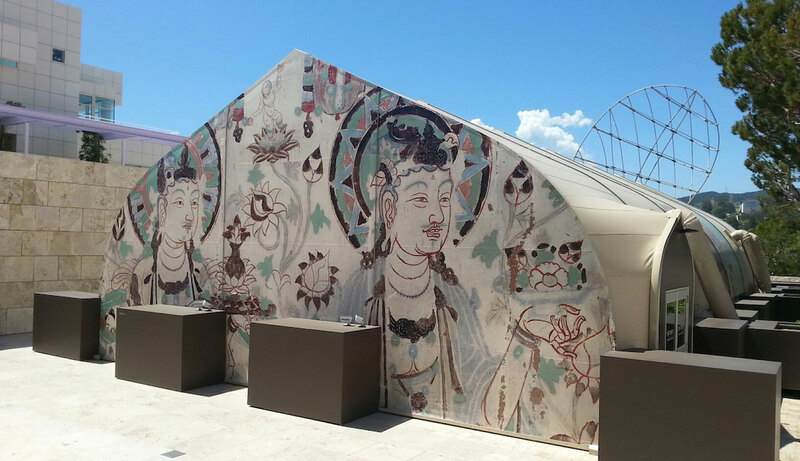 This summer, thousands of visitors to the Getty Center in Los Angeles will be transported to Dunhuang through an exhibition held to celebrate more than 25 years of collaboration between the Getty Conservation Institute (GCI) and the Dunhuang Academy to preserve this World Heritage Site. According to James Cuno, CEO of the J. Paul Getty Trust (which supports the arts through the GCI, the Getty Foundation, the J. Paul Getty Museum, and the Getty Research Institute [GRI]), the exhibition is “unprecedented in scope” and “the first in North America to fully explore the art, environment, and conservation of the Buddhist cave temples of Dunhuang.” Featuring rare paintings, manuscripts, and textiles originally from the site as well as three spectacular full-size replica caves and a 3-D video immersion experience, the exhibition, Cave Temples of Dunhuang: Buddhist Art on China’s Silk Road, gives Los Angeles residents and visitors alike a rare opportunity to view some of the most spectacular Buddhist imagery ever created. The three full-size replica caves alone are a work of remarkable artistic ingenuity. Located in a temporary structure in the Getty’s Center’s arrival plaza, the replica caves were created by artists from the Dunhuang Academy’s Fine Arts Institute using a combination of modern photography and original painting techniques and materials, including clay from the riverbed near Dunhuang. The caves do not simply replicate the paintings and sculptures of the original caves but envelop visitors in the sacred and artistic richness of each of these unique spaces. In Cave 285, the earliest cave to bear a date (538�C39), a large sculpture of the Buddha is surrounded on each wall by dynamic, fluid paintings of deities and mythical creatures from Buddhism, Hinduism, and native Chinese traditions, all rendered in the exotic style and color palette of the brief Western Wei period (535�C57). Cave 320, which dates to the 8th century, is a magnificent repository of the mature Tang period (618�C907) Chinese Buddhist imagery that influenced Buddhist painting and sculpture throughout eastern Asia. 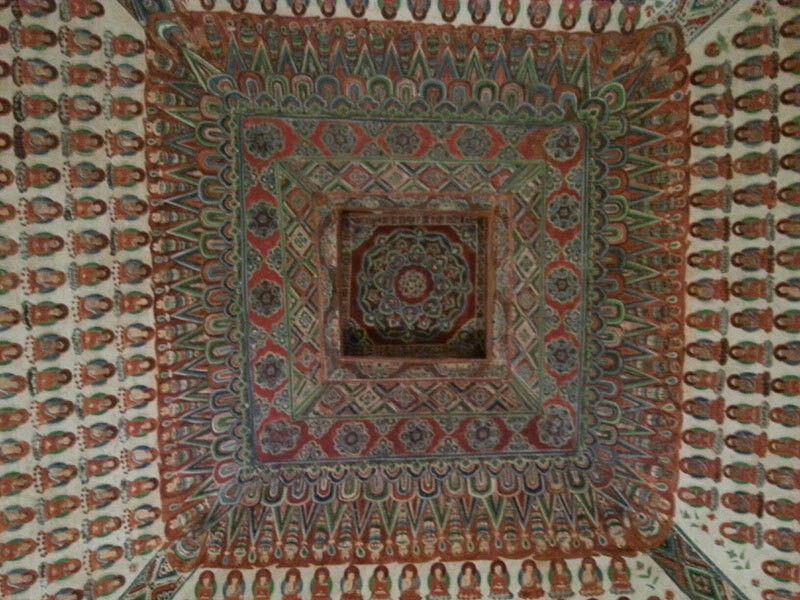 The richly painted figure of the Buddha Amitabha seated in his glorious Western Paradise on one wall and the exquisite ceiling decorated with a central lotus framed by hundreds of tiny Buddha figures are both visually lavish and technically mature expressions of this native Chinese Buddhist style. Close to the three replica caves, at the lecture hall of the GRI a large panoramic projection of views of Dunhuang gives viewers a sense of the cave site’s desert setting, while a projection using 3-D stereoscopic technology provides a hi-tech immersive experience, enabling visitors to explore details of another Tang dynasty cave (Cave 45)―a fun, educational component to the overall exhibition. However, the heart of Cave Temples of Dunhuang is found in the main galleries of the GRI. Organized by a dedicated team that included researchers, curators, and conservators at the GCI and GRI, the Dunhuang Academy, and the US-based Dunhuang Foundation, the exhibition in the GRI galleries features some of the greatest artistic treasures to have been recovered from Dunhuang, accompanied by photographs, videos, and other documentation of modern exploration and conservation efforts at the site. The exhibition comprises 43 manuscripts, paintings on silk, embroideries, preparatory sketches, and sacred diagrams on loan from such eminent European institutions as the British Museum, the British Library, the Musée Guimet, and the Bibliothèque nationale de France. Many of the works on display are from the so-called Library Cave (Cave 17), in which 40,000 objects were sealed in around 1000; these were discovered in 1900, and many were taken by European explorers to museums in Britain, France, Russia, Japan, and the United States. One of the greatest treasures is a painting in ink and pigments on silk depicting the Buddha (probably the historical Buddha, Shakyamuni) teaching under the canopy of a bejeweled tree and surrounded by four bodhisattvas and six disciples. The painting, now in the British Museum, is one of the earliest and best preserved paintings found in the cave and is notable for the extremely fine brushwork, facial detailing, and shading used to form each of the figures and to give the scene a sense of depth. A small figure of a female donor appears in the bottom left-hand corner, while the topknot of a male donor is visible in the bottom right. A roughly contemporary image, also on loan from the British Museum, is a large embroidered depiction of the Buddha teaching on Vulture Peak, flanked by two bodhisattvas. Despite its age of 1,400 years, much of the silk work has remained intact and the colors are well preserved, thanks to the dryness of the desert environment and the darkness and tight seal of the cave. 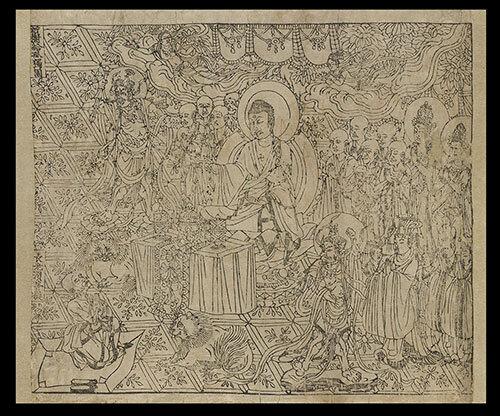 Another treasure on view is the rarely exhibited woodblock-printed Diamond Sutra, on loan from the British Library in London. Dated 868, this scroll is the world’s oldest dated complete printed book and measures over 5 meters long. Woodblock printing had been invented 100 years earlier in China, and the technology was integral to the spread of Buddhist teachings and imagery throughout Asia. The artist who carved the block for the intricately detailed frontispiece, which illustrates the Buddha surrounded by his disciples, was clearly highly experienced and skilled in his craft. From around the same period and notable for its unusual subject matter is a scroll containing a series of drawings of mudras, or hand gestures, which may have served as a reference to guide artists completing other paintings or for monastic practitioners performing rituals. The exhibition concludes with photographs, videos, and works documenting the history and significance of the Mogao Caves and a survey of modern conservation efforts. 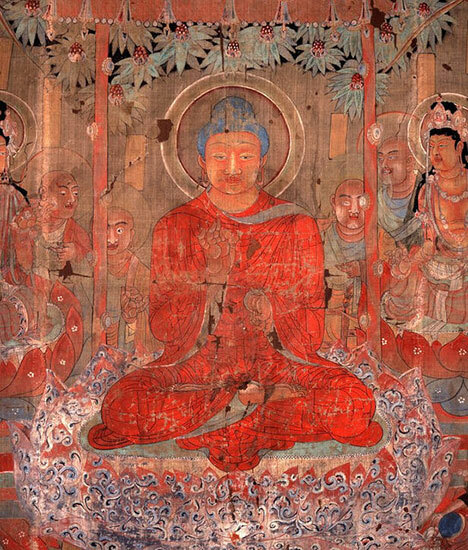 With visitors to Dunhuang increasing steadily through the 20th century, conservation issues relating to the paintings, sculptures, and structures of the Mogao Grottoes have similarly grown. Since the early 1940s, the Dunhuang Academy has undertaken the conservation, management, and research of the caves, and in 1961, they were declared a specially protected historical monument by China’s State Council, with large-scale renovation work beginning there soon thereafter. The site escaped the widespread damage inflicted on many religious sites during the Cultural Revolution, and in 1987, the Mogao Caves became a UNESCO World Heritage Site. The GCI began its collaboration with the Dunhuang Academy in 1985, working to stabilize deteriorating wall paintings inside the caves. The findings of the GCI’s report on the work completed in 2010, in particular on the causes and mechanisms of deterioration of the wall paintings in Cave 85, are now being used by the Chinese to conserve similar wall paintings in related caves. The exhibition ingeniously includes a recreated portion of a wall from this cave, using it to illustrate the life of a wall painting by tracing its 1,100-year history―from creation to deterioration to conservation. 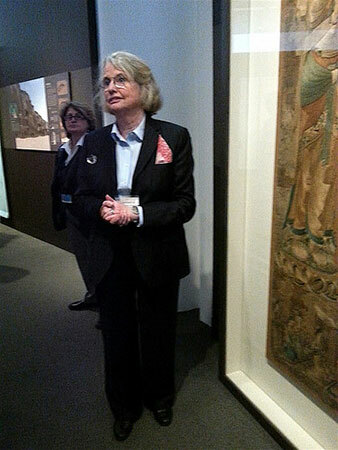 As Mimi Gardner Gates, one of the lead curators of this remarkable exhibition and chairman of the Dunhuang Foundation, points out, the Buddhist works in this exhibition “were created not as works of art, but rather as forms of devotion to accumulate merit and ensure a better afterlife” for practitioners of the Buddha’s teachings. It seems entirely fitting, therefore, that this ground-breaking exhibition concludes with a section about the recent work the various organizers of the exhibition have been doing to ensure a better afterlife for the works themselves. The exhibition Cave Temples of Dunhuang: Buddhist Art on China’s Silk Roadis on view at the Getty Center from 7 May�C4 September 2016. For further details, see The Getty. The presenting sponsor for the exhibition is The Robert H. N. Ho Family Foundation.